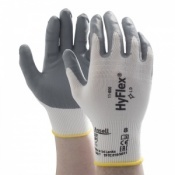 With a low-lint construction and high elasticity, the Ansell HyFlex 11-300 Seamless Low-Lint Ambidextrous Work Gloves are ideal for a wide range of industries and applications. They are ideal for food processing as they protect hands while reducing the risk of fibres coming into contact with food, and with high elasticity they allow hands to remain dexterous during assembly and handling. As they are ambidextrous, both sides can be used as the palm, doubling the life of each glove. 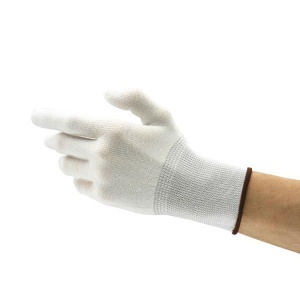 The product code for the pair of gloves is: 11-300. The 11-300 gloves provide a comfortable fit with a seamless design and stretchable stitching. 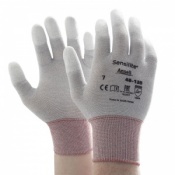 They allow hands to remain dexterous to ensure performance is not compromised, while the low-lint design reduces the risk of fibres contaminating objects being handled. The gloves can be worn on either hand, making them ideal for busy environments where quick donning is appreciated. It also means that, since either side of the gloves can be used as the palm side, the life of each glove is doubled, allowing them to last twice as long as regular, non-ambidextrous counterparts. For more information about the conformity of the 11-300 gloves when in contact with food, please see the PDF below. 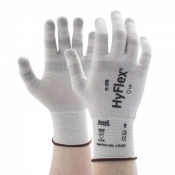 The Ansell HyFlex 11-300 Gloves are available in a choice of sizes, making them suitable for most users. Please consult the table below for details, then select the required size from the drop-down menu at the top of the page. The glove length will range from 210mm to 251mm.